bl.uk > Online Gallery Home	> Online exhibitions	> Asia, Pacific and Africa Collections	> Bebeapore ki Kothe. 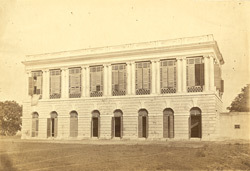 This photograph of Bibiapur Kothi from 'The Lucknow Album: containing a series of fifty photographic views of Lucknow,' was taken by Darogha Abbas Ali c.1874. Bibiapur Kothi is an example of European architecture in Lucknow, possibly designed by Frenchman Claude Martin (1735-1800). A key feature of this classical building are the wood shutters on the ground-floor doors and upper-floor windows. Nawab Asaf-ud-Daula (r.1775-1797) used Bibiapur Kothi as a hunting lodge and country house. Currently this building is used as the Government Dairy Farm. "At a spot, a few miles eastward of the city, stand the ruins of the old palace of Bebeapore. Nawab Ausuf-ood-dowlah, the first of the Newabs who made Lucknow the capital, built this palace as a country residence, and enclosed a park, in which an immensity of small game was preserved. Whenever a change of residents, or political agents, to the King's court, took place, the new arrival always had this palace placed at his disposal, until he should be conducted in state to the Residency in the city...The palace might still be so far repaired as to be inhabitable, but there does not, at present, appear to be any special way in which it could be utilized. The park is utterly neglected, and is now infested with wild animals."